I have found a yummy new way to have beautiful skin. I get to enjoy 2 pieces of chocolate mint candy every day. Neocell makes a yummy soft chew that not only tastes great but it is great for beautiful skin. 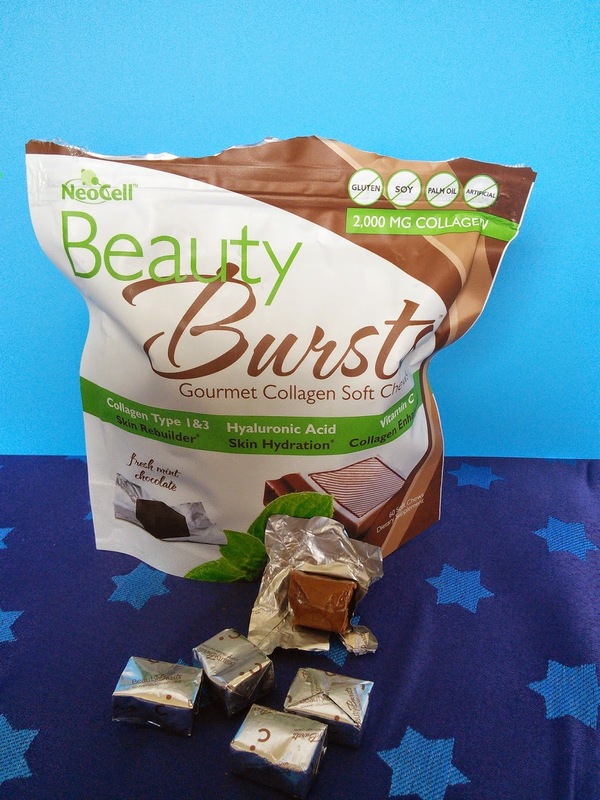 Neocell Beauty Bursts are a gourmet collagen soft chew with the taste of chocolate mint. Now having beautiful & radiant skin has never been so easy- or so delicious. NeoCell Beauty Bursts deliver high absorption beauty nutrients in two yummy chocolate mint chews. All you have to do is enjoy the taste and let the nutrients do all the work. These soft chews have collagen in them which is the beauty protein that strengthens skin, hair, and nails. The other ingredients- Hyaluronic Acid which is know as "natures moisturizer" hydrates the skin while vitamin C helps boost the collagen in your skin. I love that these three beauty nutrients work together to build beautiful skin from the inside out. You can buy these yummy chews at stores like Whole Foods, Sprouts, GNC and many others. Click on the below link to find a store in your area. To get more information on these Neocell Beauty Bursts click on the below links. Now for the best part! I have a bag of Neocell chocolate mint Beauty Bursts to giveaway to one of my readers. Just enter on the Rafflecopter form below and good luck! I have tried these before and the are so yummy! I would love to win this giveaway! I would love to try the biotin chews. I like the idea of a product that is both a treat and a vitamin. These sounds great! I love chocolate, and I would love to have beautiful skin. Tastes good and good for you - SWEET!!! I would love to try this and their Super Collagen + C!! I think I would try out the BIOTIN BURSTS - SOFT CHEWS - ACAI BERRY , they sounds yummy and great for you! I would love to try the Pomegranate from the Seed capsules. I would love to try any of the biotin chews. Oh that sounds much better than swallowing a big pill! The Collagen Sport supplement looks interesting. I like the Keratin Hair Volumizer. Ive never heard of chews for this! That's very interesting! I'd love to try some of their collagen products for my knee. Thanks for sharing the beauty bites information. I'll have to give these a try as well. I like the Biotin Bursts Soft Chews. I would love to try the Keratin Hair Volumizer! I would like to try the Super Collagen Powder for my drinks and smoothies. I would like to try the Biotin Bursts Soft Chews with Acai Berry. I like the hyaluronic acid capsules. I use and like the Keratin hair volumizer. I would like to try the hyluronic acid too. I like Resveratrol 100mg capsules. I like the Collagen Sports powder. I had it for lunch as a meal replacement using the powder, ice, two scoops of hot chocolate mix and water. I would like to try the COLLAGEN +C - 6,000MG TABLETS. The Berry Beauty Bursts would be yummy too! I wouldn't mind also trying the Keratin Hair Volumizer. I like the Collagen +C Pomegranate Liquid - 16 fl oz.